I was luckily chosen to take part in this month’s Foodbuzz 24 event. A beer pairing meal was on my agenda. It’s been a few years since I did my first one so I researched around a bit to gather ideas. I kept things simple and rounded up a few of my beer loving friends and presented a six-course beer pairing menu. The meal commenced with bite-sized gougeres which had just a breezy hint of cumin. 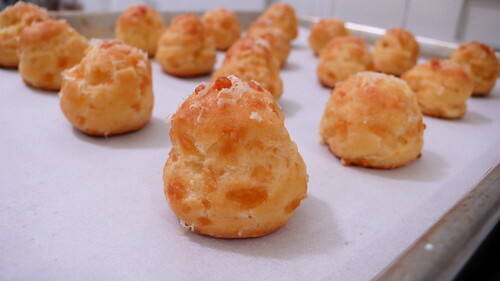 Before being baked off the pate choux mounds were topped with a shaving of parmigiano reggiano. They exited the oven perfectly puffed and were expedited to the hungry diners. 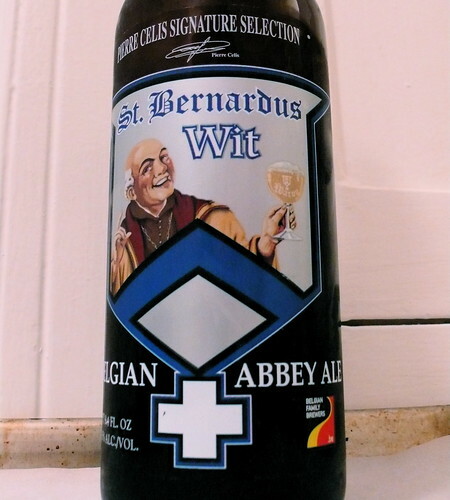 St. Bernardus Wit paired nicely with the gougeres with the echoing spice flavors and the nuttiness of the cheese complementing the wheatiness of the beer. Next came refreshing course of raw oysters. 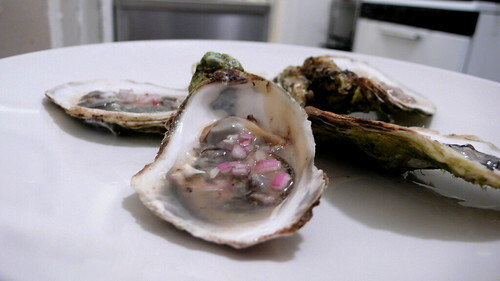 I served them with a mignonette, a classic condiment for raw oysters, but with a twist using meyer lemon juice and a touch of Champagne vinegar. As I was doing research for this dinner I found out that Irish stouts and oysters are a classic pairing. “Oysters have had a long association with stout. 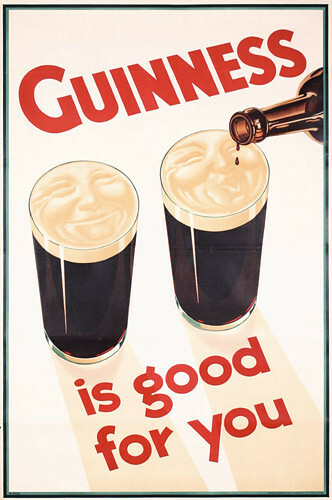 When stouts were emerging in the eighteenth century, oysters were a commonplace food often served in pubs and taverns.” [Wikipedia]. I was very intrigued indeed. I tried the pairing out at a Japanese restaurant – oyster shooters with ponzu and a Japanese stout (the name of the brewery escapes me) to the delight of my taste buds. The pairing was surprisingly harmonius, even more so than the common Champagne or sparkling wine pairing. The briny refreshing oysters and the nutty light stout really complemented each other. To get the best of both worlds though I paired my oysters with black velvet, a beer and sparkling wine cocktail. I poured Guiness halfway into a glass and then topped it off with Zonin prosecco. 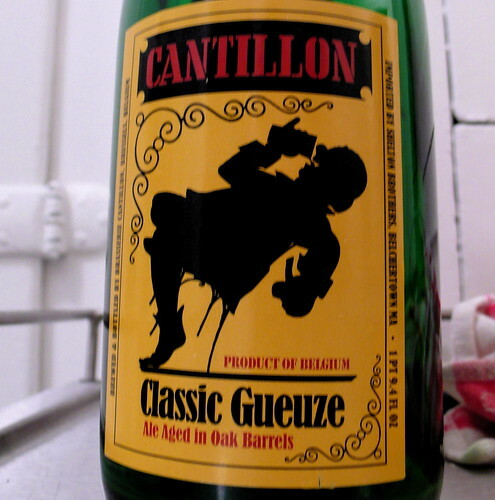 I absolutely love gueuze, a lambic blend, with all its dry, sour and yeasty characteristics. 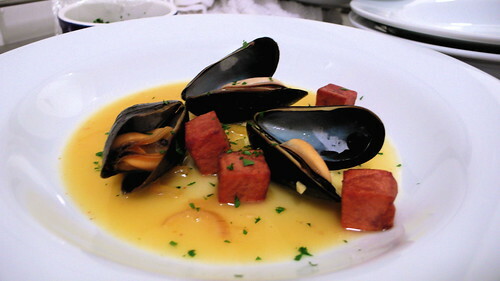 I steamed mussels with Cantillon Gueuze and added a twist with saffron creating another layer of flavor and the vibrant hue. Crispy fried purple potatoes joined the steamed mussels and the broth. We drank the rest of the gueuze with the mussels trying to slurp up every last drop of the delicious broth. 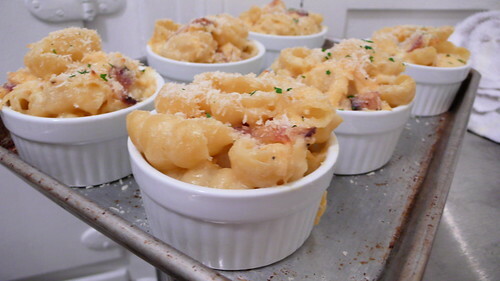 Next came the smoky mac n cheese made with smoked Holland cheese, gruyere and bacon. The mac came out great even with my average track record with this iconic American dish. It was just subtly smoky from the cheese which added just a hint of distinct savoriness that makes one’s mouth water. 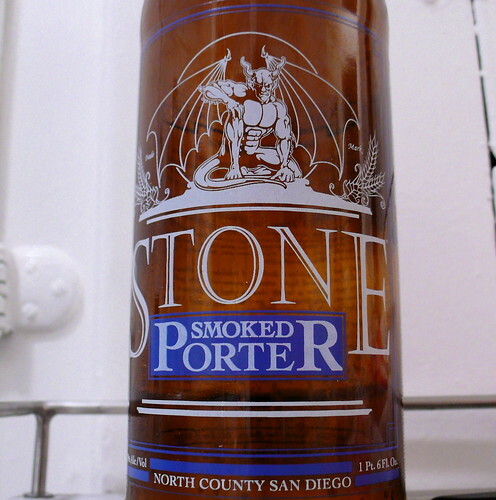 I paired the creamy mac with the roasty, balanced Stone Brewery Smoked Porter. It was not overpoweringly smokey which was perfect for the mac n cheese. I made a garlic-herb sausage using the basic pork sausage recipe from Charcuterie cookbook. 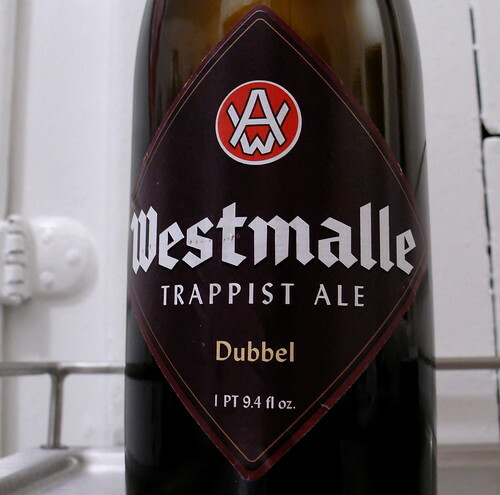 It was served very simply over creamy polenta and paired with Westmalle Dubbel. Sausages being hearty I wanted to serve a bigger beer with them. At a 7% ABV it was going to stand up nicely to the sausages. I had made a mustard relish to serve over the sausage and I completely forgot it in the fridge. 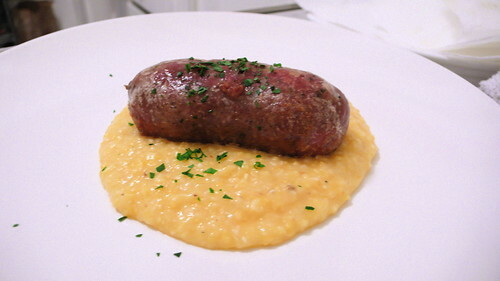 There were no complaints from the diners though since the sausage itself was so juicy and flavorful. They didn’t know they were missing out. Phew. I even made dessert. Yes, very surprising. I found out that apples pies and stouts are also a good pairing. But I was very excited to make the beer part of the dessert, an imperial stout ice cream. There are recipes for stout ice cream floating around but I wanted to up the game with an imperial stout. 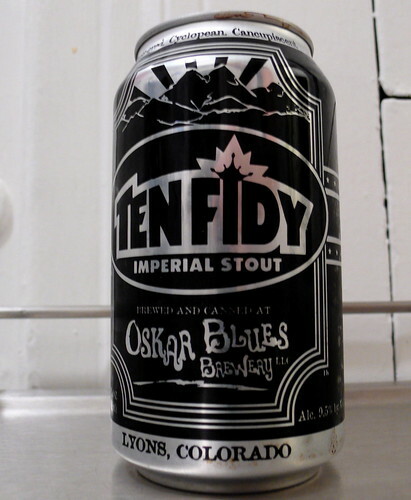 I used Ten Fidy which stands at a whoppin 10% ABV. This ice cream was straight up delicious. It was roasty with coffee and chocolate notes. It paired so well with the apple crostada, another surprising result. The dinner was a hit and much fun was had among us beer drinkers. As always good food and good company makes a great night. oooo! congrats on the 24/24/24! All hail beer, not just for drinking for cooking with it too! Nice menu, good shots…congrats! Congratulations on being selected to do a 24, 24, 24 meal. I really like your theme. The homemade sausage is making my mouth water. Just thinking how much better it could have been with the mustard relish. 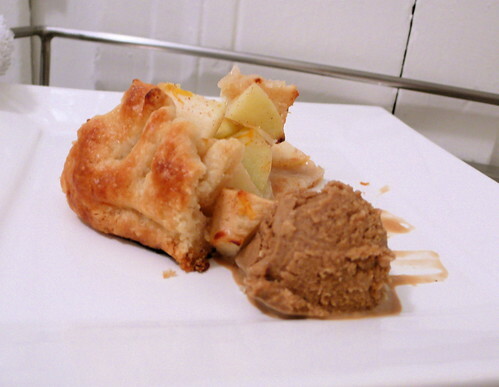 Your apple crostada and stout ice cream is a thing of beauty. Just awesome! I love that beer pairing is starting to gain in popularity. This is a great illustration of the innumerable ways to implement beer into fine dining. I was amongst the lucky diners and I can say that each and every pairing was meticulously thought out and incredibly delicious. Wow! This looks awesome! I want to try everything you had. Yum! I wish someone had invited me to a beer pairing like yours. Comfort foods and beer? Yes please! Congrats fellow 24er! All those dishes look divine–every single dish is one I can really go for right about now, especially with a beer! Great job on your entry! having a pint of the big beers definitely makes me tipsy. congrats to you too! i loved your post by the way. i’m hoping to get a smoker one of these days and make some proper ribs. i smoked ribs with a charcoal grill before and it was delicious. but with a more prolonged temperature control, i can only imagine! i love its popularity too! i wish there were more finer dining beer pairings though. i need some fresh ideas beyond my basic dishes. glad you enjoyed the dinner. the only thing better than comfort foods and beer is a nap right after. Looks amazing! Wish I could have been there.